A billed meet-and-great by the school district’s paraprofessionals’ union turned into a full-on debate Tuesday evening at the high school when Republican candidate for Mayor Erin Stewart took current Mayor Timothy O’Brien to task on taxes. “When I paid more on a car that went down in value and when I’m paying more rents because the property tax bill went up, that’s a tax increase,” Stewart said. “Believe who you want. My tax bill is right here,” Stewart said, holding it up before a crowd of about 65 in the school’s auditorium. O’Brien, the Democratic incumbent running for re-election, claimed the city collected no new taxes under his term, and insinuated that Stewart, an aide at the state capitol, had a say in a state law that raised taxes. “My opponent knows full well because she is a political staffer at the state capitol, that the change in taxes that many people experience is because of a state law that requires a re-evaluation of taxes that effects people in different ways,” O’Brien said. Stewart contended that a re-evaluation had no effect on the those taxes. “My taxes went up, so I don’t know what universe we’re on,” Stewart said. “You were in the state house for eight years. I don’t know why you didn’t care about making a change then,” Stewart countered. The debate featured Stewart and O’Brien front and center flanked by their respective slates before a small crowd of people listening in on topics ranging from taxes, education, blight, economics, and poverty. Over 15 questions were asked by the paraprofessionals and audience members. O’Brien, 45, touted his rise as a career politician from a city alderman, to city representative, to now mayor of New Britain as why people should vote for him. Helping to get people access to healthcare and working on property tax reform were other issues he pointed out. Stewart said she brings a fresh vision and enthusiasm to a city that has been divisive for too long. “I want to make hard hittin’ New Britain a better place to live, work, and to raise a family,” she said. “Look I’m 26 and proud of it,” Stewart said, adding that she I’ve been volunteering her time in the city for about 10 years, beginning on the Youth and Family Services Commission. On the issue of blight in the city, O’Brien plugged his administration’s anti-blight policy as “strong,” citing the dilapidated Berkowitz Building as something that should be converted and be put to use. Stewart countered by saying that O’Brien’s idea of fighting blight was often a quick way for the city to get involved in small tiffs between neighbors who may just be arguing over downed branches or overgrown grass. It is a waste of time and money, she argued. When asked why the opposite party should vote for each respective candidate, Stewart pointed to her own slate, which features former Democrat and mayoral candidate Mark Bernacki running for city clerk, Democrat Daniel Salerno for at-large alderman, and Libertarian Celeste Roche. “I think everybody wants to see the economy grow, they want to see our downtown prosper, they want to see our education good,” O’Brien. O’Brien said that he appeals to fiscal conservatives because he consolidated city departments from 22 to six and, “finding ways of producing efficiencies without turning to tax increases,” he claimed. On education, Stewart, who is halfway through her first term on the board of education, said she is proudest of helping bringing in Superintendent Kelt Cooper to run the school district. Both candidates agreed that the city’s school system could be doing much better. Stewart analogized it to being a place that has all the necessary tools, although those tools need to be put to the right use. “You look at the district as this kitchen, but the salt is in the attic, the pepper is in the basement; the microwave is in the closet,” she said. “They’ll have a mayor who takes it seriously to create jobs and has a plan in city hall to be able to build our economy,” O’Brien said. Prospective business owners would also have a say at the table with whoever is mayor come after Election Day, both candidates agreed. Stewart said the city should incentivize the city to move here and not penalize them with higher taxes. “Party doesn’t matter on a local level in politics. 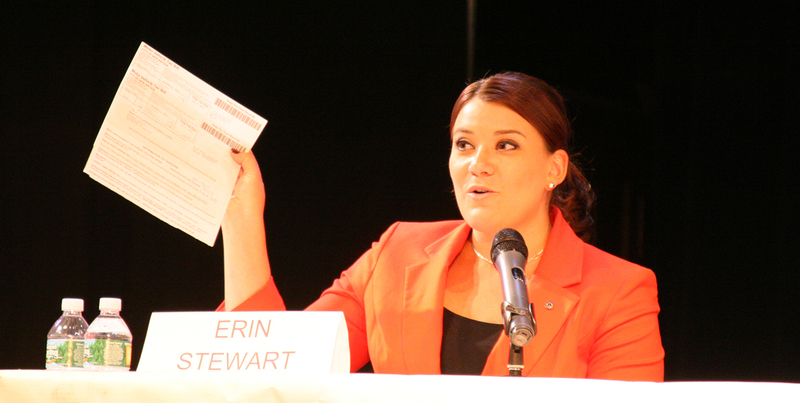 It’s about what’s best for the residents in the city of New Britain,” Stewart said.